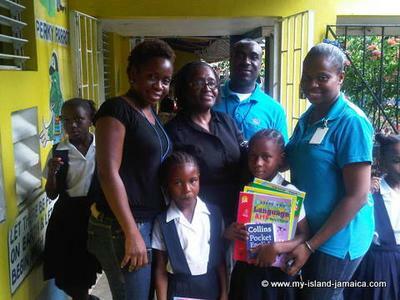 A team of co-workers from a prominent Freeport-based company in Montego Bay embarked on a Community Outreach project for the Bogue Hill All Age School in St. James. 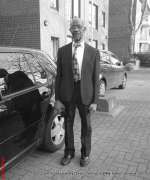 Having previously visited the school to determine the areas requiring assistance, the team went on a drive to raise the funds and items needed to assist the school. Items donated included: shoes and several pairs of socks for a needy student, thirty (30) eating bowls for the school’s breakfast feeding programme, textbooks and a dictionary for two needy sisters. The school was also presented with two boxes of reading books for the school’s reading room and the Alternative Secondary Transitional Education Programme (ASTEP) – a literacy assistance programme for students who have failed mastery of the required skills. 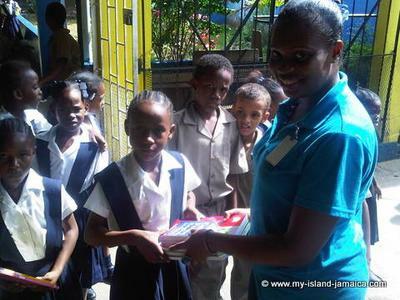 The Ramble Hill Basic School (next door) was also presented with kindergarten books for their children. Bogue Hill All Age School is a government-operated school with ten (10) classrooms and three hundred and twenty (320) students on roll. Of this population, approximately fifty percent (50%) are needy students. For upwards of fifty (50) students, the school is a haven of sorts, where they can receive a hot meal each morning, without which they would not have that essential start to their day. 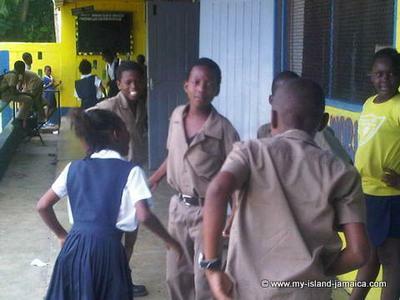 Headed by the Principal, Mrs Crooks, the school has been making leaps and bounds, despite the impoverished circumstances of many of its students. With a 92% literacy rate, the little school in the hills of Bogue is a testimony to the hard work, dedication and resilience of both staff and students alike. The reading room/library is stocked with books of all sorts, and the staff room has been converted to house a computer room. There are also various sports-related trophies lining the shelves behind the principal’s desk, attesting to the school’s involvement and achievements in sports. The circumstances of this little school with a big heart, appealed to the team of co-workers, who were embarking on a Thanksgiving (US holiday) project to "give back". The needs seemed overwhelming at first but, with the support of their wider department, they were able to put together the care package for the school. The Principal, Mrs Crooks, was unavoidably absent for the presentation, but Mrs Jackson (the Vice-Principal) accepted the donation on behalf of the school. The looks on the faces of the two students who received their textbooks were a mixture of surprise, elation and gratitude. Students of grades one and two respectively, the sisters are brilliant, intelligent and show huge potential to become productive citizens. The team is looking forward to the execution of Phase Two, which will consist of a food drive collecting items for the school’s breakfast programme. The presentation will be made for the January school term. Projects like these are a testimony that, despite the economic difficulties being faced, individuals are still willing to give of their means to assist those less fortunate. Children are a country’s most valuable resources, and it would make a world of difference if those in a position to do so give of their time, finances and means to assist them to reach their highest potentials. As this small group of co-workers demonstrated, you do not have to have a lot to make a difference. 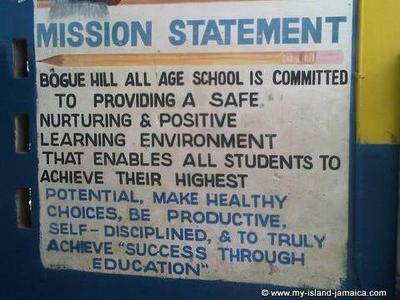 You too can make a difference at Bogue Hill All Age, call 876-971-7464. Join in and write your own page! It's easy to do. How? 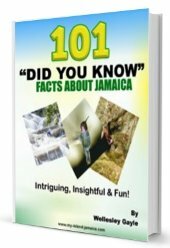 Simply click here to return to Jamaica Press Releases.